Unseen by the human eye. The carnival is over. 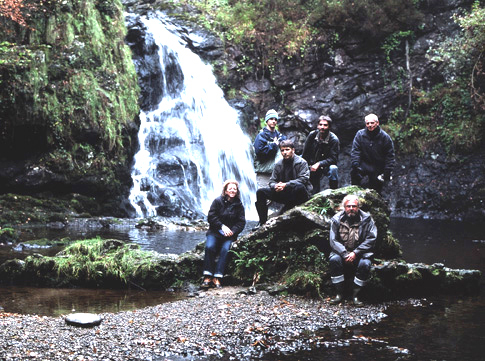 Group shot, from a previous PhotoTour in the West of Ireland! Photographers in their element; and check out those "Wellingtons!" Our comprehensive workshops, tutoring sessions, and semester-long courses at local colleges, etc. run in length from specialized. as-needed. one-on-one instruction to one-night Introductions to NPy; two, or three-night workshops; and on to a semester in length - involving field work, great locations, follow-up critiques, planned visits from special guest lecturers, and a few surprises! 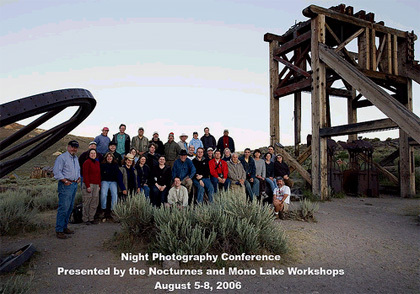 Newly created, our advanced NPy Workshop, The Advanced Digital Nocturne explores the nocturne, as captured exclusively with digital media. See examples of work created by alumni in our workshops, and read comments by some of the participants in our various programs. You will learn to evaluate existing lighting situations and compose/expose accordingly. Most workshops are limited to 10-12 participants (semester-length courses, sometimes more) who will be closely supervised on location by one to two instructors, depending on final number of registrants. Students will provide their own equipment and are expected to be familiar with basic photographic techniques. Many of our semester-length courses deal with portfolio development during the second part of the course(s). The links at the top of this page will take you to a detailed description of the individual workshops and a link to download a registration form. Founder/Director Tim Baskerville is no stranger to the nocturne having worked in this area of photography for more than 25 years.